We’d love your help. 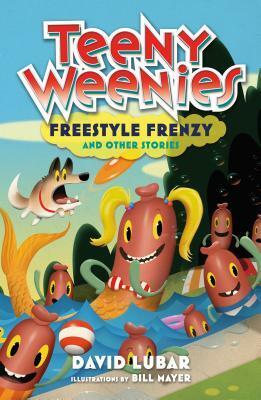 Let us know what’s wrong with this preview of Teeny Weenies by David Lubar. Suspiciously swift swimmers at a school swim meet cause a frenzy. A boy who likes to litter finally gets the meaning of Earth Day. A girl and her dad go on a fishing trip and catch the surprise of a lifetime. Young chapter book readers ages 7 to 10, reluctant readers, and fans of very short stories will be entertained and delighted by these twelve za Meet the Teeny Weenies! To ask other readers questions about Teeny Weenies, please sign up. These stories are just as silly or strange as the originals with plenty of surprise twists and belly laughs, but not quite as scary. Readers find out about what aliens do when they kidnap humans. Bullies become "beanie weenies" at a cookout. There's the "Left Hand of Dorkiness" where the kids learn not to call the lunch lady a witch (and the author riffs on an Ursula K. LeGuin title). In case anyone didn't know, "The best way to get a Weenie to do something is to make him think it's a prank." Map reading skills from a video game save the day for a Weenie on vacation. And a couple of carnival Weenies encounter a horde of zombies. Scheduled for release in April, these anthologies are great for fans of the "Diary of Wimpy Kid" movies who still want a shorter read, or who enjoy short stories for the ease of dipping in and out of a book. Bill Mayer, who has done the cover art for the original series, has created wonderful illustrations for the interiors of these new titles - including a full-page with multiple panels (like a comic book) for the beginning of each story. From swimming impersonators and magical lemonade stands to freezing spray and a groundhog's prediction for spring, Lubar's book has it all. This is a cute collection of twelve short stories that will entertain younger crowds. Thank you NetGalley and Macmillan-Tor/Forge for the opportunity to read an advance reader copy.